This BLT pasta is a dish that marries two of my favorite meals together. I just took all the ingredients inside a BLT sandwich (sans the bread) and put them with pasta. I love things spicy so I also added some spicy chili flakes and "BOOM" you have a marriage made in heaven. 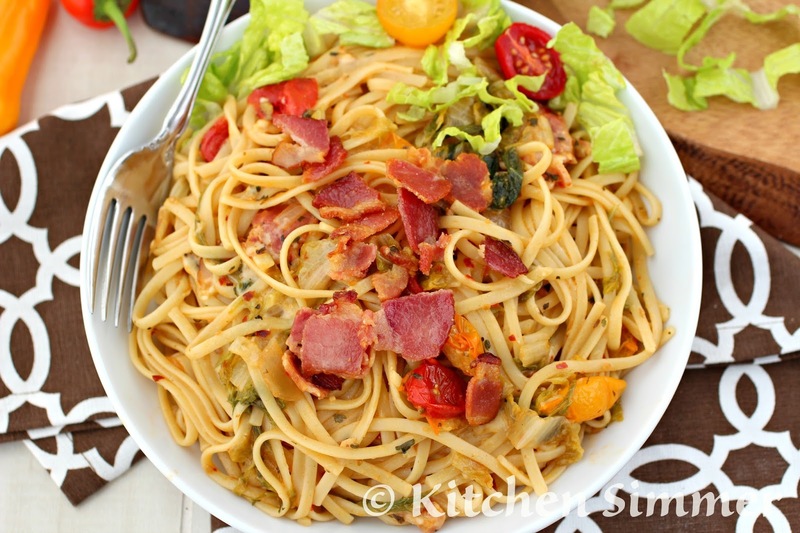 My family loved this dish so much everyone asked for seconds and since it's made with budget friendly pasta and ingredients that I needed to use up before they got too old to use, it saved me money too. Have you ever cooked lettuce? I know, it may sound really weird, but it can be cooked. Have you ever thrown out lettuce that may not be great for a salad, but still good otherwise? When I make a salad, all my ingredients have to be fresh, fresh, fresh. Sometimes when I buy those big packs of produce from Costco, the last two bunches of romaine gets some limp edges and that makes it no good for a salad in my book. I hate to toss good food out, so this saves me from wasting good (not great) lettuce. I also had a couple pints of grape tomatoes that were starting to look less than fresh for a salad. I simply sliced them and they gave some great flavor to the pasta. I also threw in some garlic, oregano and basil for good measure because they all go so well with tomatoes and that created my light pasta sauce. Last, but not least, there is Bacon! 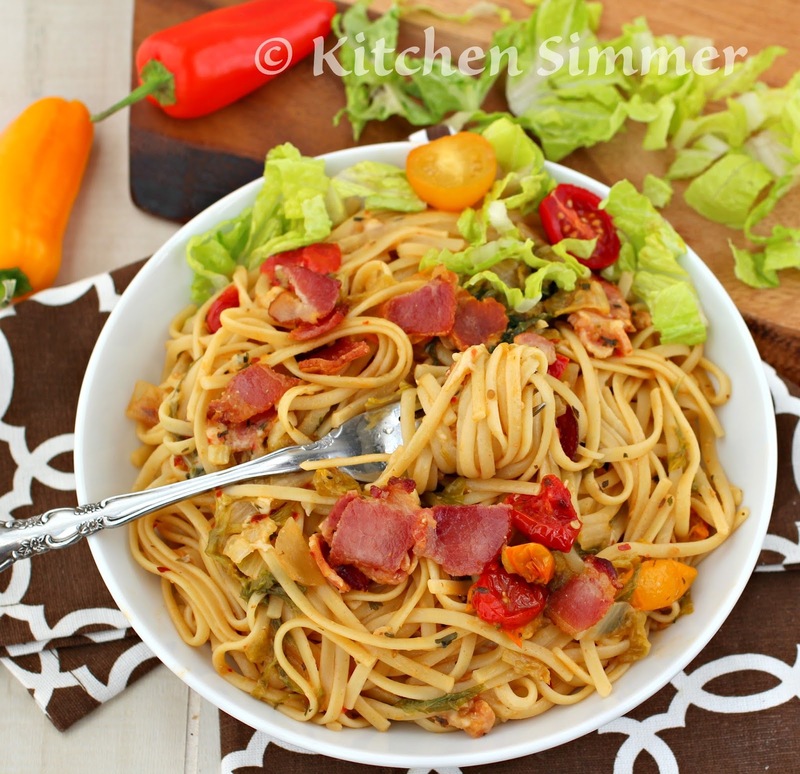 I love the smokey and salty flavor the bacon gives this dish. Here is a tip for you: If I am going to "chop" bacon, I don't bother pulling out a chopping board and knife. I simply use my cooking shears and slice the entire slab over my pan. It's so easy and no icky bacon grease on my cutting board to scrub off. 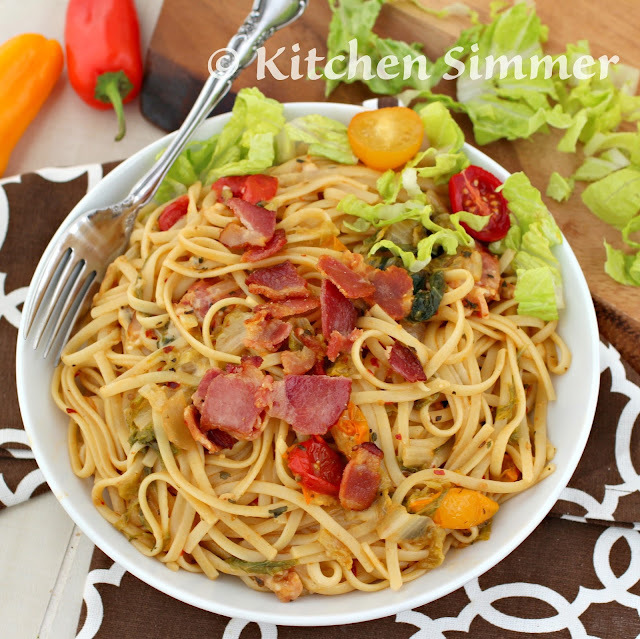 This pasta was such a surprise hit for me! I loved how well it all turned out and I loved that I used ingredients that may have ended up in my trash bin if I had not put them to good use. So always think, fresh is best, but if it's not fresh... cook your salad! Ha! Ha! Note: Salt is to taste in this dish. Remember the bacon will give salt as well as the Parmesan cheese. The pasta should be cooked in well salted water to season it prior to adding it to the dish. Step 1: Boil pasta in well salted pasta water 1 minute shy of fully cooked to desired texture. Reserve 1/2 cup of pasta water before draining pasta. Reserved drained pasta until later. Step 2: Cut bacon and fry until browned, but not too crispy. Drain on paper towel. Remove all bacon grease from pan except for 2-3 Tbs worth. Step 3: Saute chopped onion and garlic in reserved bacon grease on medium high heat (do not burn garlic). Then add black pepper, parsley, oregano, basil and red chili flakes and saute for a minute. Step 4: Next add tomatoes to pan ( I chopped them in half). Saute for 2-3 minutes. Add a little salt. Then add the sliced fresh lettuce. Saute for 2-3 minutes. Next add the cup of reserved pasta water and cook for a minute. Step 5: Add the drained cooked pasta and the browned bacon to pan. Toss well. Then add the grated Parmesan cheese and toss well. Taste for salt and season as needed. Serve hot. Enjoy. Oh YEAH, this looks like weekend lunch! Oh yes, I love my kitchen shears too. For bacon, and everything else! Great flavorful pasta dish and a wonderful new use for romaine. 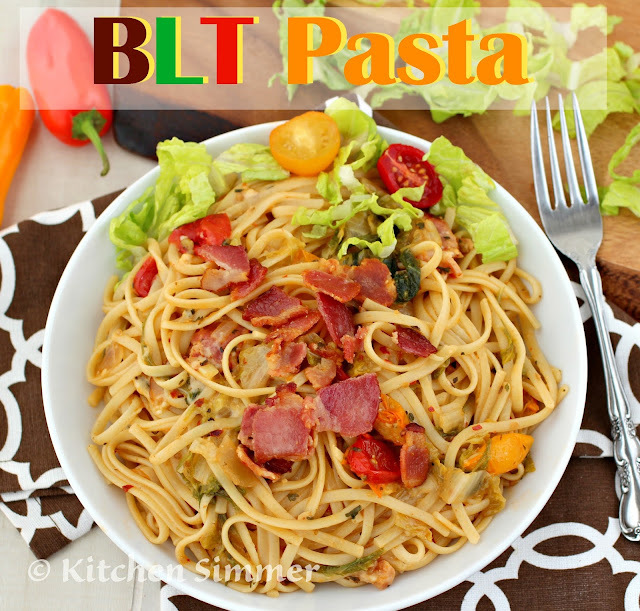 Love blt sandwiches, but I have never tried blt pasta! This sounds so good! I love your waste not want not way of making a meal. This is so inventive and I would love a big pot of this to so we could have leftovers.